Yesterday, I had the pleasure of giving a lecture for the Universiteit van Vlaanderen, a science communication platform where Flemish academics are asked to answer “a question related to their research“. This question is aimed to be highly clickable and very much simplified. The lecture on the other hand is aimed at a general lay public. I build my lecture around the topic of materials simulations at the atomic scale. This task ended up being rather challenging, as my computational research has very little direct overlap with the everyday life of the average person. I deal with supercomputers (which these days tend to be bench-marked in terms of smartphone power) and the quantum mechanical simulation of materials at the atomic scale, two other topics which may ring a bell…but only as abstract topics people may have heard of. 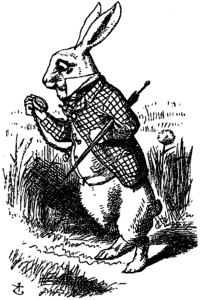 Therefor, I crafted a story taking people on a fast ride down the rabbit hole of my work. Starting from the almost divine power of the computational materials scientist over his theoretical sample, over the reality of nano-scale materials in our day-to-day lives, past the relative size of atoms and through the game nature of simulations and the salvation of computational research by grace of Moore’s Law…to the conclusion that in 25 years, we may be designing the next generation of CPU materials on our smartphone instead of a TIER-1 supercomputer. …did I say we went down the rabbit hole? The television experience itself was very exhilarating for me. Although my actual lecture took only 15 minutes, the entire event took almost a full day. Starting with preparations and a trial run in the afternoon (for me and my 4 colleagues) followed by make-up (to make me look pretty on television 🙂 … or just to reduce my reflectance). In the evening we had a group diner meeting the people who would be in charge of the technical aspects and entertainment of the public. And then it was 19h30. Tensions started to grow. The public entered the studio, and the show was ready to start. Before each lecture, there was a short interview to test sound and light, and introduce us to the public. As the middle presenter, I had the comfortable position not to be the first, so I could get an idea of how things went for my colleagues, and not to be the last, which can really be destructive on your nerves. …and down the rabbit hole we went. 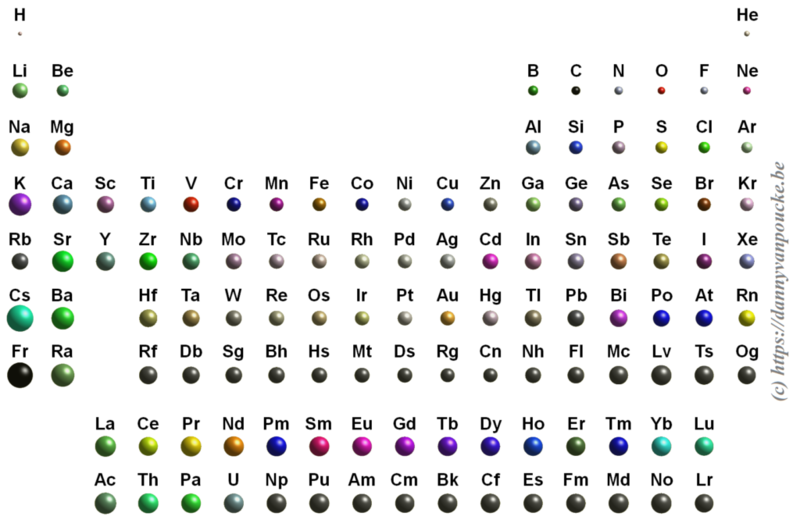 Full periodic table, with all elements presented with their relative size (if known) created for the Universiteit van Vlaanderen lecture. 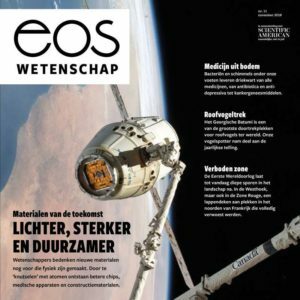 This summer, I had the pleasure of being interviewed by Kim Verhaeghe, a journalist of the EOS magazine, on the topic of “materials of the future“. Materials which are currently being investigated in the lab and which in the near or distant future may have an enormous impact on our lives. While brushing up on my materials (since materials with length scales of importance beyond 1 nm are generally outside my world of accessibility), I discovered that to cover this field you would need at least an entire book just to list the “materials of the future”. Many materials deserve to be called materials of the future, because of their potential. Also depending on your background other materials may get your primary attention. In the resulting article, Kim Verhaeghe succeeded in presenting a nice selection, and I am very happy I could contribute to the story. Introducing “the computational materials scientist” making use of supercomputers such as BrENIAC, but also new materials such as Metal-Organic Frameworks (MOF) and shedding some light on “old” materials such as diamond, graphene and carbon nanotubes. 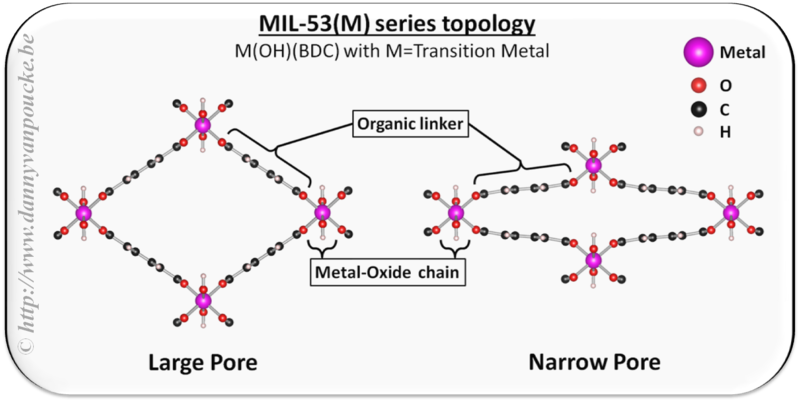 Graphical Abstract: Evolution of the electronic band structure of MIL-47(V) upon OH-functionalization of the BDC linker. The π-orbital of the BDC linker splits upon functionalisation, and the split-off π-band moves up into the band gap, effectively reducing the latter. Metal–organic frameworks (MOFs) have gained much interest due to their intrinsic tunable nature. In this work, we study how linker functionalization modifies the electronic structure of the host MOF, more specifically, the MIL-47(V)-R (R = −F, −Cl, −Br, −OH, −CH3, −CF3, and −OCH3). It is shown that the presence of a functional group leads to a splitting of the π orbital on the linker. Moreover, the upward shift of the split-off π-band correlates well with the electron-withdrawing/donating nature of the functional groups. For halide functional groups the presence of lone-pair back-donation is corroborated by calculated Hirshfeld-I charges. In the case of the ferromagnetic configuration of the host MIL-47(V+IV) material a half-metal to insulator transition is noted for the −Br, −OCH3, and −OH functional groups, while for the antiferromagnetic configuration only the hydroxy group results in an effective reduction of the band gap. Bart Sorée receives a commemorative frame of the event. Foto courtesy of Rajesh Ramaneti. Today I have the pleasure of chairing the last symposium of the year of the MRS chapter at UHasselt. 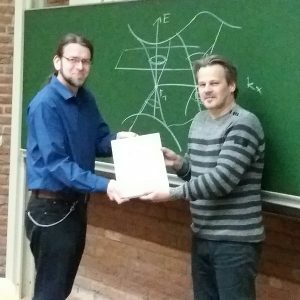 During this invited lecture, Bart Sorée (Professor at UAntwerp and KULeuven, and alumnus of my own Alma Mater) will introduce us into the topic of topological insulators. This topic became unexpectedly a hot topic as it is part of the 2016 Nobel Prize in Physics, awarded last Saturday. On the Nobel Prize website you can find this document which gives some background on this work and explains what it is. Beware that the explanation is rather technical and at an abstract level. They start with introducing the concept of an order parameter. You may have heard of this in the context of dynamical systems (as I did) or in the context of phase transitions. In the latter context, order parameters are generally zero in one phase, and non-zero in the other. In overly simplified terms, one could say an order parameter is a kind of hidden variable (not to be mistaken for a hidden variable in QM) which becomes visible upon symmetry breaking. An example to explain this concept. Example: Magnetization of a ferromagnet. In a ferromagnetic material, the atoms have what is called a spin (imagine it as a small magnetic needle pointing in a specific direction, or a small arrow). At high temperature these spins point randomly in all possible directions, leading to a net zero magnetization (the sum of all the small arrows just lets you run in circles going nowhere). This magnetization is the order parameter. At the high temperature, as there is no preferred direction, the system is invariant under rotation and translations (i.e. if you shift it a bit or you rotate it, or both you will not see a difference) When the temperature is lower, you will cross what is called a critical temperature. Below this temperature all spins will start to align themselves parallel, giving rise to a non-zero magnetization (if all arrows point in the same direction, their sum is a long arrow in that direction). At this point, the system has lost the rotational invariance (because all spins point in direction, you will know when someone rotated the system) and the symmetry is said to have broken. Within the context of phase transitions, order parameters are often temperature dependent. In case of topological materials this is not the case. A topological material has a topological order, which means both phases are present at absolute zero (or the temperature you will never reach in any experiment no matter how hard you try) or maybe better without the presence of temperature (this is more the realm of computational materials science, calculations at 0 Kelvin actually mean without temperature as a parameter). So the order parameter in a topological material will not be temperature dependent. To complicate things, topological insulators are materials which have a topological order which is not as the one defined above 😯 —yup why would we make it easy 🙄 . It gets even worse, a topological insulator is conducting. OK, before you run away or loose what is remaining of your sanity. A topological insulator is an insulating material which has surface states which are conducting. In this it is not that different from many other “normal” insulators. What makes it different, is that these surface states are, what is called, symmetry protected. What does this mean? In a topological insulator with 2 conducting surface states, one will be linked to spin up and one will be linked to spin down (remember the ferromagnetism story of before, now the small arrows belong to the separate electrons and exist only in 2 types: pointing up=spin up, and pointing down=spin down). Each of these surface states will be populated with electrons. One state with electrons having spin up, the other with electrons having spin down. Next, you need to know that these states also have a real-space path let the electrons run around the edge of material. Imagine them as one-way streets for the electrons. Due to symmetry the two states are mirror images of one-another. As such, if electrons in the up-spin state more left, then the ones in the down-spin state move right. We are almost there, no worries there is a clue. Now, where in a normal insulator with surface states the electrons can scatter (bounce and make a U-turn) this is not possible in a topological insulator. But there are roads in two directions you say? Yes, but these are restricted. And up-spin electron cannot be in the down-spin lane and vice versa. As a result, a current going in such a surface state will show extremely little scattering, as it would need to change the spin of the electron as well as it’s spatial motion. This is why it is called symmetry protected. On Monday, we had the second day of our colloquium on Porous Frameworks, containing no less than 4 full sessions, covering all types of frameworks. We started the day with the invited presentation of Prof. Dirk De Vos of the KU Leuven, who discussed the breathing behavior in Zr and Ti containing MOFs, including the work on the COK-69 in which I was involved myself. In the MOFs presented, the breathing behavior was shown to originate from the folding of the linkers, in contrast to breathing due to the hinging motion of the chains in MIL-47/53 MOFs. After the transition metals, things were stepped up even further by Dr. Stefania Tanase who talked about the use of lanthanide ions in MOFs. These lanthanides give rise to coordinated water molecules which appear to be crucial to their luminescence. Prof. Donglin Jiang, of JAIST in Japan, changed the subject to the realm of COFs, consisting of 2D porous sheets which, through Van Der Waals interactions form 3D structures (similar to graphite). The tunability of these materials would make them well suited for photoconductors and photoenergy conversion (i.e. solar cells). With Prof. Rochus Schmid of the University of Bochum we delved into the nitty-gritty details of developing Force-Fields for MOFs. He noted that such force-fields can provide good first approximations for structure determination of new MOFs, and if structure related terms are missing in the force-field these will pop up as missing phonon-frequencies. Prof. Monique Van der Veen showed us how non-polar guest molecules can make a MOF polar, while Agnes Szecsenyi bravely tackled the activity in Iron based MIL-53 MOFs from the DFT point of view. The row of 3 TU Delft contributions was closed by the invited presentation of Prof. Jorge Gascon who provided an overview of the work in his group and discussed how the active sites in MOFs can be improved through cooperative effects. Prof. Jaroslaw Handzlik provided the last invited contribution, with a comparative theoretical study of Cr-adsorption on various silicate based materials (from amorphous silicate to zeolites). The final session was then closed by the presentations of Dr. Katrine Svane (Bath University) who discussed the effect of defects in UiO-66 MOFs in further detail and Marcus Rose presenting his findings on hyper-crosslinked Polymers, a type of COFs with an amorphous structure and a wide distribution in different pore sizes. This brought us to a happy end of a successful colloquium, which was celebrated with a drink in the city center of Groningen. Tuesday we traveled back home, such that Wednesday Sylvia could start at the third part of the conference-holiday roller coaster by leaving for Saltzburg. 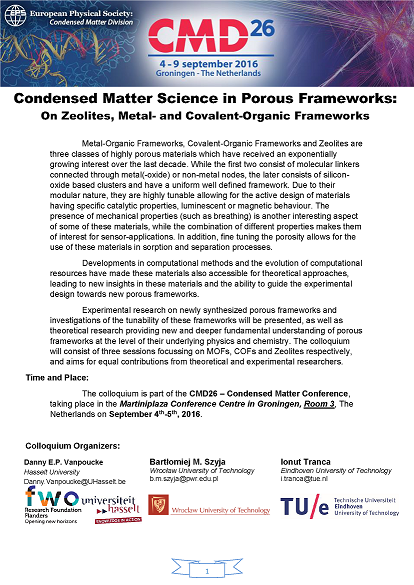 Today the CMD26 conference started in Groningen, and with its kick-off also our own 2-day colloquium on porous frameworks (aka MOFs, COFs and Zeolites) was launched. During the two sessions of the day, the focus mainly went out to the Zeolites, with Prof. Emiel Hensen of the Technical university of Eindhoven introducing us to the subject and discussing how new zeolites could be designed in a more rational way. He showed us how the template used during synthesis plays a crucial role in the final growth and structure. Dr. Nakato explained how alkali-metal nanoclusters can undergo insulator to metal transitions when incorporated in zeolites (it is due to the competition between electron-electron repulsion and electron-phonon coupling), while Dr. De Wijs informed us on how Al T-sites need to be ordered and assigned in zeolites to allow for the prediction of NMR parameters. After the coffee break Dr. Palcic, from the Rudjer Boskovic Institute in Croatia, taught us about the role of heteroatoms in zeolites. She told us that even though more than 2 million theoretical structures exist, only 231 have officially been recognized as having been synthesized, so there is a lot more work to be done. She also showed that to get stable zeolites with pores larger than 7-8 Angstrom one needs to have 3 and 4-membered rings in the structure, since these lead to more rigid configurations. Unfortunately these rings are themselves less stable, and need to be stabilized by different atoms at the T-sites. You must be shapeless, formless, like water. When you pour water in a cup, it becomes the cup. When you pour water in a bottle, it becomes the bottle. When you pour water in a teapot, it becomes the teapot. he clarified how water behaves inside these porous materials. Our first colloquium day was closed by Ir. Rohling, who took us back to the zeolite scene (although he was comparing the zeolites to enzymes). He discussed how reactivity in zeolites can be tweaked by the confinement of the reacting agents, and how this can be used for molecule identification. More importantly he showed how multiple active site collaborate, making chemical reactions much easier than one would expect from single active site models. After all was said and done, it was time to relax a little during the conference welcome reception. And now time to prepare for tomorrow, day 2 of our colloquium on porous frameworks. Visit to Stockholm. 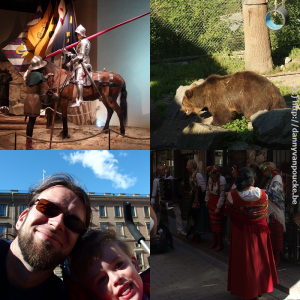 The knight at the Medeltidsmuseet (top left), brown bear in Skansen (top right), visiting the Royal palace (bottom left) and local entertainment in the old city center (bottom right). Summertime is a time of rest for most people. For our little academic family, last summer was a bit of a roller coaster; alternating holidays with hard work which had been postponed too much. The last vestige of my start of a new chapter (moving the remaining stuff from the apartment to our house) was finally bested. Now the conference roller coaster has started with Sylvia’s plenary lecture on conceptual spaces in Stockholm. As neither of us ever visited Sweden before, we decided to turn it into a semi-family-holiday as well. Our 4-year-old son enjoyed his first ever plane flight (he wasn’t really convinced something impressive was going on). And while Sylvia was of to the conference, the two of us went to explore Stockholm: Finding the knight in the Medeltidsmuseet (at the left in the back of this beautiful museum 🙂 ) and searching for the king and queen at their palace (they weren’t there 🙁 ). Or visiting one of the oldest open-air musea; Skansen (similar to Bokrijk in Belgium) where we saw old professions at work (making cheese for example) and native Scandinavian farm and wild animals (from peacocks to brown bears). “I have a question”(ik heb een vraag). This is the name of a Belgian (Flemisch) website aimed at bringing Flemisch scientists and the general public together through scientific or science related questions. The basic idea is rather simple. Someone has a scientific question and poses it on this website, and a scientist will provide an answer. It is an excellent opportunity for the latter to hone his/her own science communication skills (and do some outreach) and for the former to get an good answer to his/her question. All questions and answers are collected in a searchable database, which currently contains about fifteen thousand questions answered by a (growing) group of nearly one thousand scientists. This is rather impressive for a region of about 6.5 Million people. I recently joined the group of scientists providing answers. What is the relation between the density of a material and its thermal expansion? I was wondering if there exists a relation between the density of a material and the thermal expansion (at the same temperature)? In general, gasses expand more than solids, so can I extend this to the following: Materials with a small density will expand more because the particles are separated more and thus experience a small cohesive force. If this statement is true, then this would imply that a volume of alcohol should expand more than the same volume of air, which I think is puzzling. Can you explain this to me? Unfortunately there exists no simple relation between the density of a material and its thermal expansion coefficient. Let us first correct something in the example given: the density of alcohol (or ethanol) is 46.07 g/mol (methanol would be 32.04 g/mol) which is significantly more than the density of air which is 28.96 g/mol. So following the suggested assumption, air should expand more. If we look at liquids, it is better to compare ethanol (0.789 g/cm3) to compare water (1 g/cm3) as liquid air (0.87 g/cm3) needs to be cooled below -196 °C (77K). The thermal expansion coefficients of wtare and ethanol are 207×10-6/°C and 750×10-6/°C, respectively. So in this case, we see that alcohol will expand more than water (at 20°C). Supporting Denis’ statement. A gas (in contrast to a liquid or solid) has no own boundary. So if you do not put it in any type of a container, then it will just keep expanding. The change in volume observed when a gas is heated is due to an increase in pressure (the higher kinetic energy of the gas molecules makes them bounce harder of the walls of your container, which can make a piston move or a balloon grow). In a liquid or a solid on the other hand, the expansion is rather a stretching of the material itself. Furthermore, the density does not play a role at all, in case of the expansion of an ideal gas, since p*V=n*R*T. From this it follows that 1 mole of H2 gas, at 20°C and a pressure of 1 atmosphere, has the exact same volume as 1 mole of O2 gas, at 20°C and a pressure of 1 atmosphere, even though the latter has a density which is 16 times higher. There are quite a lot of materials which show a negative thermal expansion in a certain temperature region (i.e. they shrink when you increase the temperature). One well-known example is water. The density of liquid water at 0 °C is lower than that of water at 4 °C. This is the reason why there remains some liquid water at the bottom of a pond when it is frozen over. The way a material expands due to temperature variations is a rather complex combination of different aspects. It depends on how thermal vibrations (or phonons) propagate through the material, but also on the possible presence of phase-transitions. In some materials there are even phase-transitions between solid phases with a different crystal structure. These, just like solid/liquid phase transitions can lead to very sudden jumps in volume during heating or cooling. These different crystal phases can also have very different physical properties. During the middle-ages, tin pest was a large source of worries for organ-builders. At a temperature below 13°C β-tin is more stable α-tin, which is what was used in organ pipes. However, the high activation energy prevents the phase-transformation from α-tin to β-tin to happen too readily. At temperatures of -30 °C and lower this barrier is more easily overcome.This phase-transition gives rise to a volume reduction of 27%. In addition, β-tin is also a brittle material, which easily disintegrates. During the middle ages this lead to the rapid deterioration and collapse of organ-pipes in church organs during strong winters. It is also said to have caused the buttons of the clothing of Napoleon’s troops to disintegrate during his Russian campaign. As a result, the troops’ clothing fell apart during the cold Russian winter, letting many of them freeze to death. 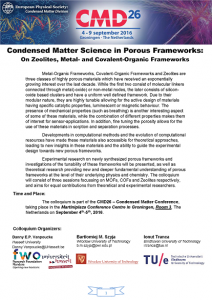 Together with Ionut Tranca (TU Eindhoven, The Netherlands) and Bartłomiej Szyja (Wrocław University of Technology, Poland) I am organizing a colloquium “Condensed Matter Science in Porous Frameworks: On Zeolites, Metal- and Covalent-Organic Frameworks” which will take place during the 26th biannual Conference & Exhibition CMD26 – Condensed Matter in Groningen (September 4th – 9th, 2016). During our colloquium, we hope to bring together experimental and theoretical researchers working in the field of porous frameworks, providing them the opportunity to present and discuss their latest work and discoveries. Zeolites, Metal-Organic Frameworks, and Covalent-Organic Frameworks are an interesting class of hybrid materials. They are situated at the boundary of research fields, with properties akin to both molecules and solids. In addition, their porosity puts them at the boundary between surfaces and bulk materials, while their modular nature provides a wealthy playground for materials design. We invite you to submit your abstract for oral or poster contributions to our colloquium. Poster contributions participate in a Best Poster Prize competition. The deadline for abstract submission is April 30th, 2016. The extended deadline for abstract submission is May 14th, 2016. CMD26 – Condensed Matter in Groningen is an international conference, organized by the Condensed Matter Division of the European Physical Society, covering all aspects of condensed matter physics, including soft condensed matter, biophysics, materials science, quantum physics and quantum simulators, low temperature physics, quantum fluids, strongly correlated materials, semiconductor physics, magnetism, surface and interface physics, electronic, optical and structural properties of materials. The scientific programme will consist of a series of plenary and semi-plenary talks and Mini-colloquia. Within each Mini-colloquium, there will be invited lectures, oral contributions and posters. Feel free to distribute this call for abstracts and our flyer and we hope to see you in Groningen! Today was the first day of the three-day long diamond conference at the university of Hasselt. And although this sounds as-if it is a mere small-scale local conference, it is actually one of the two main international conferences in the field. The Surface and Bulk Defects in Diamond (SBDD) workshop grew in twenty years from a small event with only a few dozen participants to the current event with over 200 participants. As such, it is the place to be, for one as me, who is dipping into a new field of materials. One thing that already became quite clear today, is the fact that there are many opportunities in this field for the computational materials scientist, as the large majority of the researchers are experimentalists. Of the >120 posters presented, I have only discovered about 5 theoretical ones. Having had very nice chats with their presenters I already learned a lot of what I will have to keep in mind when studying diamond. But so far, I have not come across any issues that are impossible to resolve, which is good news :-).